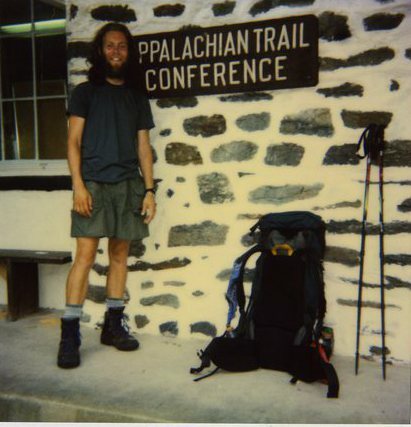 Not really Adirondack specific but I saw this on Facebook and thought the community here might be interested. 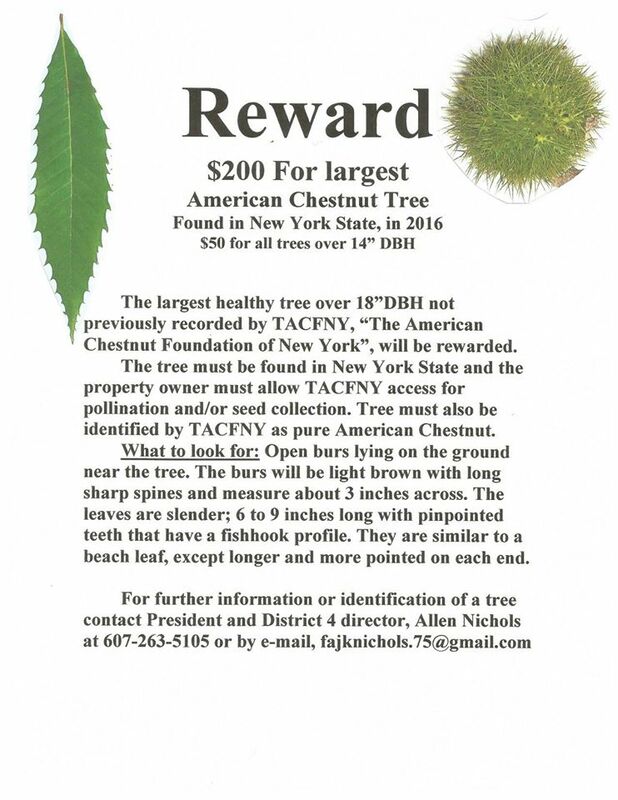 The American Chestnut Foundation is offering rewards to those who can find large chestnut trees still standing in NY. There is a $200 prize for the largest tree, and a $50 prize for every tree over 14 inches diameter at breast height (DBH). I'm a chest nut myself. Too bad that species has disappeared in many states. iT PRODUCES BEAUTIFUL WOODWORKING WOOD. Probably has a booby trap around it to prevent it from being firewood! Neat post. Wonder how many of us walked by a Chestnut tree without knowing it. There is an article in this month's " The Belted Kingfisher" by Tom Salo discussing a Genetically Modified American chestnut tree. I tried planting some American Chestnuts years ago but to no avail, I didn't have time to take care of them properly. I am always on the look out for big trees and have met several State Champs and a couple National Champs. The National Champion Norway Spruce hangs out at Root Glen (Hamilton College) and I believe the NC Common Juniper is somewhere in Letchworth State Park. I would like to see an American Chestnut of any size , just to wish it luck. Decades ago a family friend (now deceased) planted chestnut seedlings all around our county. This was probably in the 60s or 70s. As a kid I remember going on hikes with Larry and my father to see the trees. All eventually succumbed to the blight AFAIK. A few years ago I was hiking in one of the parks we used to frequent and I spotted a branch with a chestnut leaf. I stopped in my tracks and checked it out. It was a small sapling growing out of a "dead" stump. Apparently this is common for chestnuts with the blight. They will die and then send up new trunks which will eventually also die. The tree never maturing and ultimately dying altogether. My guess is all the trees Larry planted were from the same stock and thus none would be resistant to the blight. "My guess is all the trees Larry planted were from the same stock and thus none would be resistant to the blight." My hat off to Larry, he gave it a shot. My hat off to DT, for evoking Larry's effort. I've worked with the ACF to get blight-resistant strains planted around town. They're 90+% likely to resist blight, yet retain the look of the real American chestnut (vs. the Chinese). It's just a matter of time before they're back. They're great trees. I've read that a healthy mature chestnut produces enough calories in nuts to sustain someone for 6 months. Yes, that's right. The blight only kills the above-ground part of the tree. The roots will send up new growth, but it is genetically identical to the parent tree. Sometimes the new tree will reach maturity and reproduce, but it will eventually die from the blight. There are a few mature chestnuts around Lake George and some in the Catskills, but none are big, but they ARE reproducing. I've seen a number of Chestnuts in the wild, but never very big. As others have stated, the blight doesn't kill the roots, and the roots will send up new shoots after the previous stem has died. Harvard Forest, in MA, is a great place to see (small) chestnut trees in the wild- the understory of the forest there is filled with thousands of them. Because the blight cannot survive underground, there is a neat trick that can be used to keep the chestnut trees alive. One can fill a plastic bag with soil, and then duct tape it to the tree over any spots where the blight is present. This will kill the blight and keep the tree healthy. It is a very labor intensive process (and one that never ends), but it is also relatively cheap compared to treatments for other types of tree diseases. I remember hearing a story about a large American chestnut that was found at the Five Rivers Environmental Education Center in Delmar several decades ago. After it was found, someone tried to pollinate it using flowers from another American chestnut. In doing so, they introduced blight to the tree, and it was dead within a matter of months. For those hunting chestnuts, be aware that to the untrained eye, the leaves of chestnut oaks look very similar (and in fact, chestnuts are closely related to the oaks and beeches). Last edited by DSettahr; 01-28-2016 at 03:32 PM..
Where could one get blight-resistant strains of chestnut? The Holland Land Company established towns, ranges & lots in my region (SW NYS) between 1800 and 1810 or so, after the Seneca Iroquois had been forced onto reservations. The head surveyors kept logs in which they recorded, among other observations, the trees they were seeing along the new lot lines as they moved through the virgin forest. Amazing how often chestnut is mentioned. I've seen mention in local histories of early farmers collecting wagonloads of the nuts to feed to cattle or to ship to cities for human consumption. Since chestnut lasts in contact with soil as long as does today's pressure treated wood, standing chestnut fence posts can still be found. Made a beautiful furniture and flooring wood as well. As I understand it, prior to the blight, approximately 25% of trees found in hardwood forests in the Appalachian mountains were chestnuts. When backpacking in PA, it's not uncommon to see massive old stumps that were obviously felled by a saw. According to one guidebook I read, many of these stumps were chestnut trees that were cut a century ago- definitely a testament to how long the wood can last. This conversation has reminded me to stop more often and take in the beauty of mature white ash--since future generations might not have the same opportunity. And also to think that the impacts our choices can have upon ecosystems. Even recreational use can have significant consequences if we aren't careful. Moving of firewood is a known vector for the spread of invasive insects. And it's also believed that white nose syndrome, which has been decimating bat populations in the northeast, may have been brought into the country via contaminated recreational caving equipment. Our town had to work with them and sign some paperwork, to ensure that we don't sell the trees, or that we try and make seedlings, and that the ACF can come inspect them, but other that it was pretty easy. They're not at the point where they just sell blight-resistant seeds. These were saplings that were expected to be resistant, no guarantees. That may be possible. AFAIK, the fungus does not directly attack the roots, only the above ground part of the tree. The roots will send up new growth, but that will in turn be attacked by the fungus. Maybe there is only so much stress a tree can take? The next one to be extinct will be the ash tree from the emerald ash borer. Trees are being cut down as fast as possible before they get infected.